Louisiana became a state April 30, 1812, the 18th state admitted to the Union. In 1699 French explorer Pierre Le Moyne d’Iberville (1661-1706) spotted a red-stained pole adorned with fish and bear parts separating the hunting grounds of two Indian tribes. Baton Rouge, for “red stick,” is the name that stuck for this place on the bluffs of the Mississippi River. French colonists established a military post here in 1719. One-third of Baton Rouge today is of French descent, and the accent can be heard throughout the area. In addition to France, Baton Rouge has functioned under the governance of England and Spain. Louisiana became a state in 1812, and Baton Rouge was incorporated in 1817. It officially became the state’s capital in 1849, as state government moved from New Orleans into a newly completed Gothic Revival capitol building. Baton Rouge was occupied by Union forces during the Civil War, and the capitol building was used as a prison. After the war, state government returned to New Orleans, where it remained until 1882, finally returning and remaining in Baton Rouge. 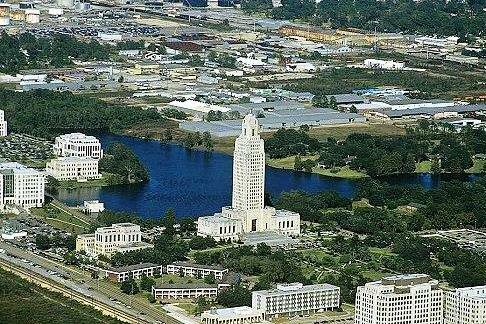 The current highrise capitol was built in 1932, under the aegis of Governor Huey P. Long. It has 34 stories and is 450 feet high. Long was assassinated in the lobby of the building – the walls are nicked with bullet holes – and he is buried on the front lawn. Louisiana State University (LSU) is located here. It is home of The Southern Review, one of the world’s most prestigious literary journals, founded in the 1930’s. The Cajun French of it, the joy of food and the good times roll; the dare to be what it wants to be; the audacity of the levees, standing up to the mighty Mississippi; the lazy bayous and moss-draped trees; plantation memories. Mountains near: Driskill Mountain, a landform in the northern part of the state, is the highest point in Louisiana at 535 feet. Miles to three nearest State Capitals: Jackson, MS 175; Little Rock, AR 361; Montgomery, AL 367. Miles to National Capitol in Washington, DC: 1,146.